KRUU HARD DRIVES DOWN - Your help is urgently needed! Update as of 4/02 @ 10pm: we've received $2285, over 75% of the way there! Thanks Gary G, Chris S, David J, Michael G, Luke S, Susan F, Cole F, Doug H, Steve B, John F, Andy B, Steve S, Bob M, Brandon N, Kevin R, Monica H, Rich S, Darien S, and Rob H.
If you donate now, the amount you put in will be doubled up to $650. We're almost there. PLEASE CONTRIBUTE TODAY! Thank you! Update 3/23: progress on backup vault, its happening. The new vault has been rebuilt with new motherboard, ram , OS and drives, and installed into the KRUU server rack. The vault files are currently being synced over... a multi-day process. After that, some final configuration will be completed to allow for the new vault to serve files to the KRUU workstations. We're about half way towards our full goal of a fully redundant master/backup Vault system. Check here for updates on progress (funding and work). Had a great time talking with MUM Radio Production students today, stoked to see what they create! Had a great time talking to the MUM Media Students about Community Radio, here's the presentation slides. Backups and Back...Ups! KRUU's Mission Control, Vault and other robots. Friday evening around 10pm, the computer that is the main program source within the main on-air production studio (aka as Mission Control) experianced a hardware fault. Specifically the motherboard in the computer started to fail, resulting in system instability and usability issues (for example, the mouse stopped working!). With only a slight impact to the broadcast, Caleb Flynn (KRUU Director and tech master) replaced the machine with a backup (one of two backup machines that are generally availible at the station) and brought Mission Control back UP! within minutes. 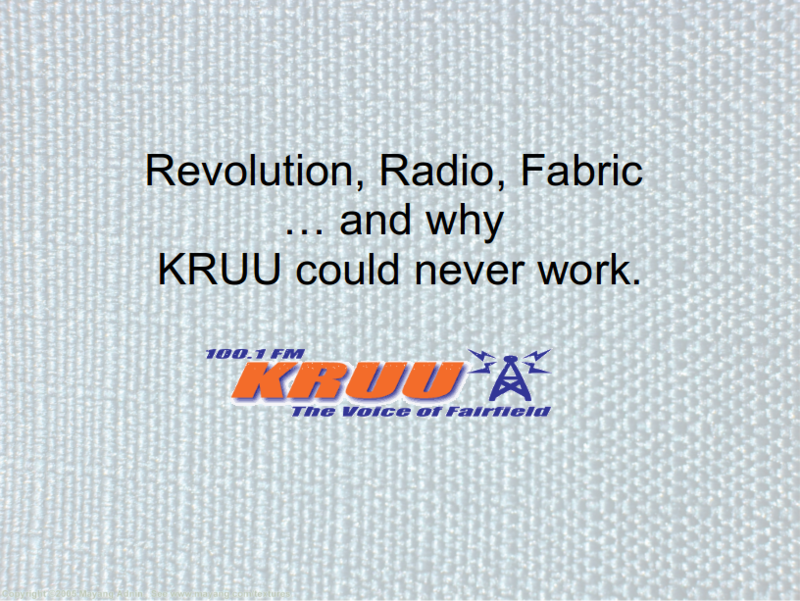 Impact of this failure was reletively small, and was relatively easy to fix because of the network structure that KRUU has deployed at the station. All the important program material is stored on the Vault, a highly fault-tolerant server, and all workstations (mission control included) connect to the Vault on boot up, and store all program-related files there as part of normal operations. 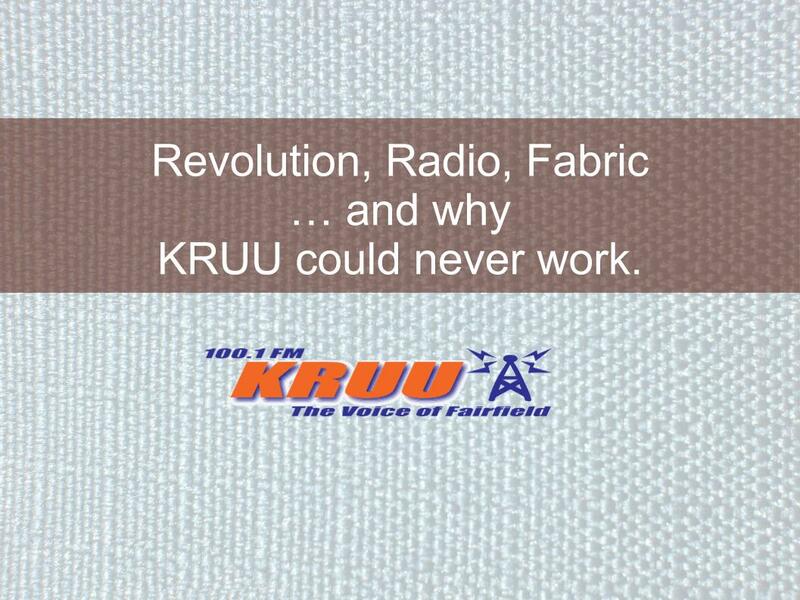 Today, I gave an overview presentation of the technology that runs KRUU to the great radio production class over at MUM. Handout/slide is attached and shows a listing of most of the software that we use to run KRUU. I had the distinct pleasure of talking with MUM's Media and Communications class today regarding KRUU. It was a great group with great questions and great discussion. I've attached the presentation slides from my talk to this post, in both OpenOffice and MS format.